HubSpot is excited to announce a new integration with Slack - which marks the beginning of a strong product partnership between our companies. You can now get HubSpot tasks, notifications and slash commands within Slack. Slack is a digital workplace that connects you to the people and tools you work with everyday. Tools like HubSpot. You can now get HubSpot tasks, notifications, and slash commands -- directly within Slack. Say goodbye to the days of wasting time switching between tools. Instead, work where you want with HubSpot and Slack. Stay connected to activities in your HubSpot CRM and receive notifications within Slack. Select which notifications you want to receive from an array of options such as reminders, mentions, follows, document views, form submissions, and more. It’s the little shortcuts that keep your day running smoothly. 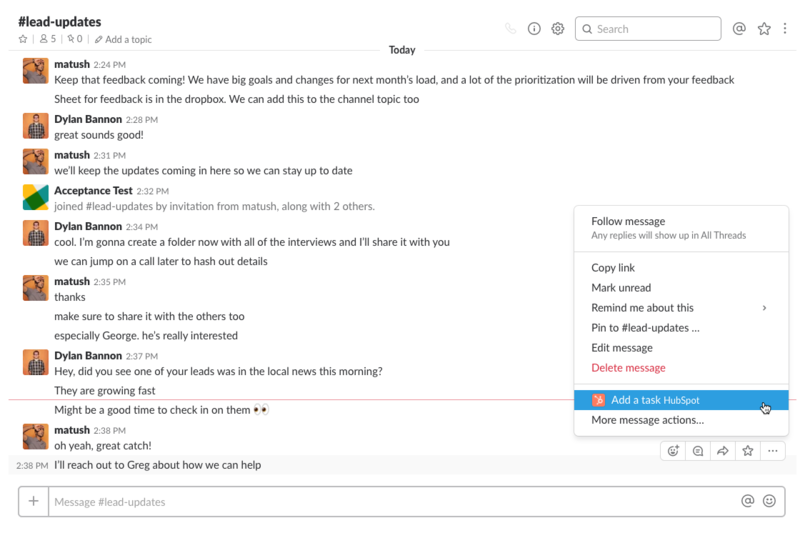 With the HubSpot Slack integration, you can use slash commands to search for and share a HubSpot CRM contact or provide feedback to the HubSpot team about the Slack integration -- all without leaving Slack. Learn more about the partnership from HubSpot Chief Strategy Officer Brad Coffey.